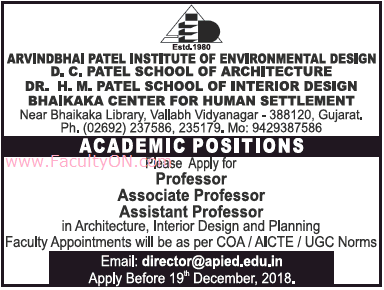 D.C.Patel School of Architecture, Gujarat has advertised for recruitment of Teaching Faculty- Professor / Associate Professor / Assistant Professor jobs vacancies. Interested and eligible job aspirants are requested to apply on or before 19th December 2018. Check out further more details below. About College: D.C. Patel School of Architecture: It offers five-year (10 semesters) B.Arch. course, recognized by AICTE & Council of Architecture, New Delhi. Degree is awarded by the Sardar Patel University. Eligibility for admission is Higher Secondary (XII standard) passed in Science Stream.